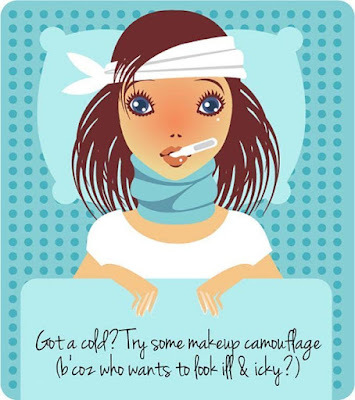 Red, watery eyes, runny nose, blotchy skin and chapped lips… having a cold or the flu isn’t very nice. It’s not just that you feel awful but you don’t look too pretty either. But there’s no need to let a nasty chill wreak havoc with your looks (or your plans). Master these easy beauty tricks and face the world looking terrific, despite the sniffles. If the winter chills have left your complexion looking tired and pasty, use a gentle cleansing scrub to rev up circulation and make skin glow. Follow with a hydrating, vitamin-rich moisturiser, like Dermalogica’s Multivitamin Power Concentrate, to soothe soreness around the nose. Pale, sick faces sometimes need a bit of artificial health pumped into them – a sweep of blush will make you look sprightly and healthy. Red and blotchy skin is a sure sign of an unhappy immune system. Use products that counter the redness, like Smashbox’s Photo Finish Color Correcting Foundation Primer, then damp-sponge on a sheer liquid foundation to even out the skin tone. Bring out the skin brighteners like Stila’s One Step Illuminate. Unlike many other makeup products, which contain titanium dioxide – a white substance that adds opacity (not what you want when you are tired) – skin brighteners pack crushed rose quartz and mother-of-pearl, which reflect light to perk up your skin. Caking concealer over dark circles will only emphasise them further. Instead, dot some where your eye meets the bridge of your nose and blend outwards. Opt for a lightweight concealer that’s one shade lighter than your skin tone. Clinique’s Even Better Concealer is perfect for this. Follow with a light layer of loose powder. And that’s not all: Brighten up groggy eyes with over-the-counter eyedrops that will give them a good cleanse and tone down redness. Plus, run a white eyeliner along the inside rim to make tired eyes look fresher. Also remember that watery eyes can make your mascara run in nasty streaks. So, when colds strike, go waterproof. Dry, cracked lips are painful and ugly. Restore their smoothness with this old-school trick: brush your lips with a toothbrush smeared in Vaseline. This will buff off any loose skin and leave your lips soft and rosy. For a more permanent solution, heal cracked or damaged lips with a super salve like Burt’s Bees Replenishing Lip Balm with Pomegranate Oil. Finally, slick on a little lip gloss; lipsticks are usually to drying and hence avoidable during this time. How do you deal with being sick? Are you the indulge-me type or do you prefer to just get up and keep going?